In a small mixing bowl, add soy sauce, Chinese five-spice blend, lemon juice, honey, and garlic. Whisk until combined, then pour over diced chicken. In a sauté pan, add a half tablespoon of oil and cook chicken on medium-high heat until cooked through. In a wok or large sauté pan, add a half tablespoon coconut oil over medium-high heat, then add onion and carrots. Stir-fry for two minutes or until onions are translucent. Add quinoa and stir, making a gap in the middle of the pan. Crack both eggs in the middle of the quinoa mixture. 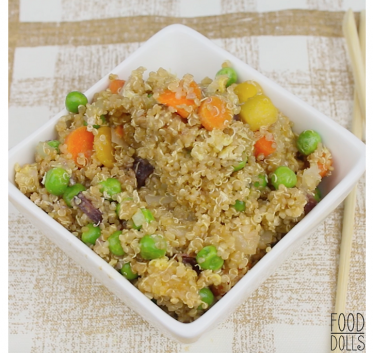 Stir eggs until cooked, then combine with quinoa, onions and carrots. Add cooked chicken, peas, soy sauce, sesame oil, garlic and ginger. Stir until everything is combined and garnish with green onions. Enjoy!